Cates said: “As I have gone through my career, it’s coincided with women becoming more involved in sport. I see it with younger reporters coming through and women who are in the earlier stages of their careers. “They see a path for themselves now, whereas I’m not sure I did. Gabby Logan, Sue Barker (aside), there weren’t that many women to help me see a path for myself. But as I kept on working things started to open up as I went along. I’ve never been the first woman to do anything, but I still think there is a perception that women won’t be able to make the next step, when in fact that’s not the case at all. The 42-year-old was chosen to be part of Setanta’s Premier League coverage in 2007, and has since worked on many forms of football packages, ranging from the Football League to the 2010 FIFA World Cup. Cates was part of a four-person lecture panel at the University’s Eastbourne campus. 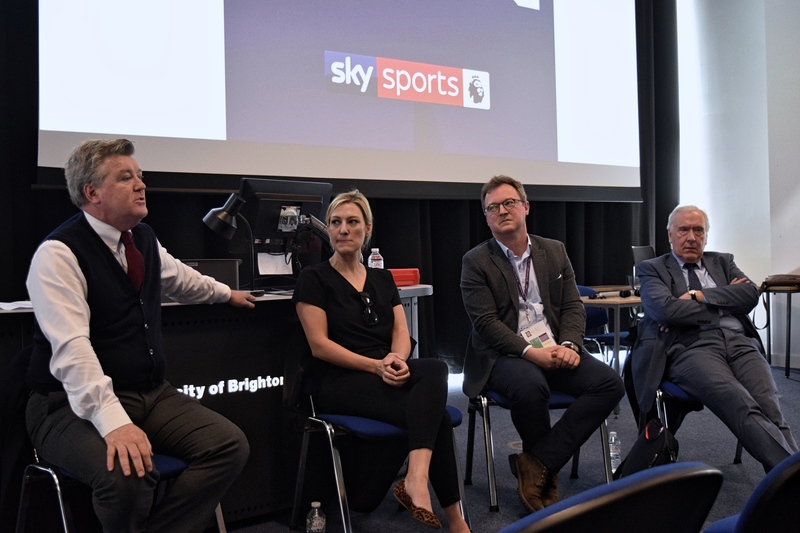 The panel also featured fellow Sky Sports colleagues Geoff Shreeves, Martin Tyler and Billy McGinty. The trio shared views on the importance of journalism. 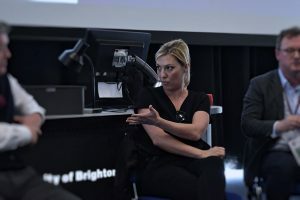 Tyler, Sky Sports commentator and considered the voice of football, is concerned for the future of journalism, due to, he said, television becoming more pictorial and musical and far less journalistic. He did support journalism though, adding: “At ITV when I was an editorial assistant, we dealt all the time with stories, and for every game it is ‘what is the story’. I always read all the papers after the game to see how they’ve reported it journalistically. If you want to be a journalist, the who, what, when, how and why are always important – the facts of the matter are always important. This entry was posted in Journalism, Journalism courses, Sport journalism by Kerry Burnett. Bookmark the permalink.